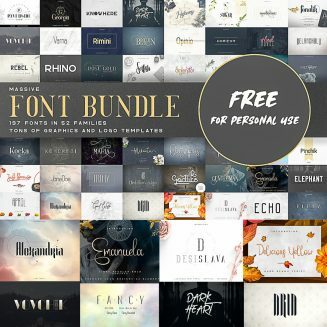 Get 52 typefaces including 197 fonts + tons of graphics and logo templates for free( for personal use). Post deleted at the request of the copyright owner. File format: .otf, .ttf, .ai, .psd, .eps for Photoshop or other software. Tags: branding, decorative font, font bundle, font collection, logo font, outline, sans serif, script font, symbol, typeface.